Hello fruit, you’re looking fine! Tomorrow kicks off our fruit shares– plus we have our monthly special products pick-up (beer, soap, fish and kombucha), and Lewis Waite Farm orders. All pickups are July 20th at Sunnyside Community Services from 5-8pm. Walla Walla Onions – Juicy, sweet and perfect for grilling. The stems can be discarded or used as a stock. Use within a week. Beets – Try them raw or cooked, or our summer favorite: grilled! Use within a week. 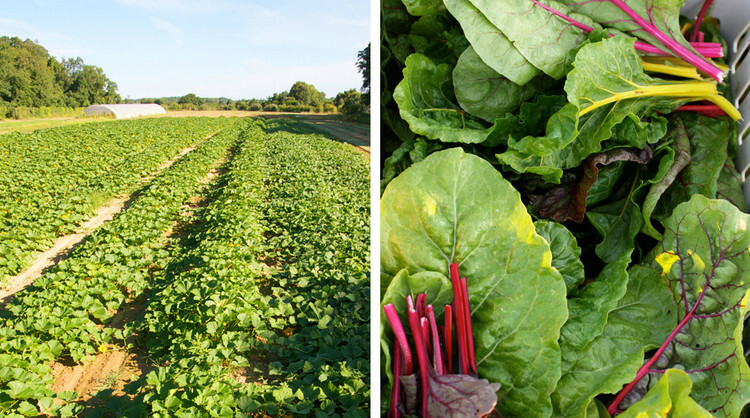 Swiss Chard – A hearty summer green, this is one that is not meant to be eaten raw. Try this recipe from Golden Earthworm if you’re a newbie to this veggie. Use within a week. Green Cabbage – This cabbage is great as a slaw, but can also be used stuffed, baked, in soups or salads. Use within 5 days. Red Batavian Lettuce – A nice summer lettuce, this variety is similar to Romaine, but a slightly softer texture. Use within a week. Parsley – A great fresh flavor and packed full of nutrients. Use within a week. 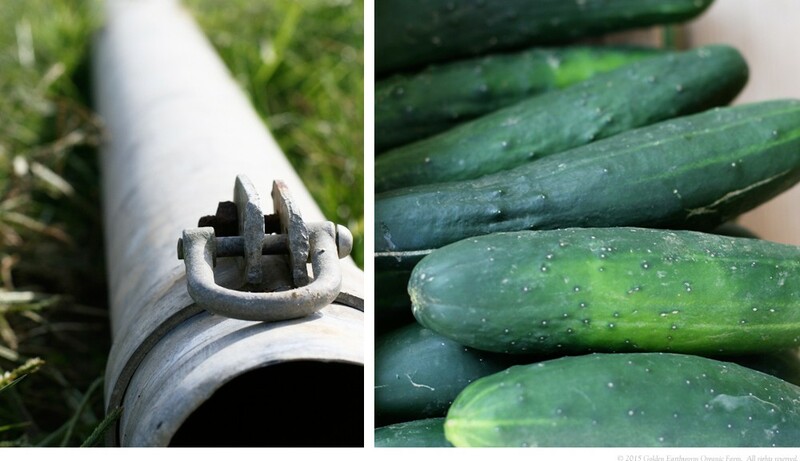 Cucumber – Another round to keep you cool during the heat waves. Use within a week. Summer Squash or Zucchini – These have had a bit of a mystery growing season, so we’re not sure when they’ll make it into the box. Because of a delivery change by Kimball Brook Farm, milk orders must be placed by 9:00am tomorrow (Friday) for next Thursday’s deliver. For everything else the deadline is Monday, July 17th. Happy shopping! Learn more about the ordering process here. Sign up for an account by clicking here, or going to csalewiswaitefarm.com. Did you love that fresh basil smell from last weeks’ box? 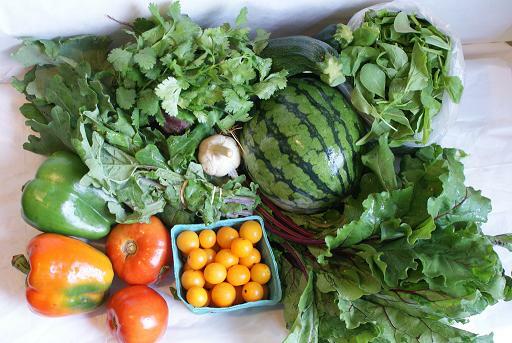 Well, we’ve got more of it–plus some vegetables firsts for the season. As usual, the veggies for this week are best stored in an airtight plastic bag in the refrigerator. If you’d like another place to find recipes for your weekly share, Golden Earthworm has a great Facebook page you can join. The veggie pickup for Thursday, July 13th will be at Sunnyside Community Services from 5-8pm. Green & Red Batavian Lettuce – A nice summer lettuce, this variety is similar to Romaine, but a slightly softer texture. Use within a week. Basil – This may be the last week for basil. If you feel like you have an overload, it can be frozen if you puree it with olive oil. Use within 3 days. Carrots – So many uses and so tasty! It’s best to remove the tops before storing them in your fridge. Use within a week. Cucumber – Another first week for this veggie, and a perfect summer addition to salads. Use within a week. Cipollini Onions – These special onions, known as Little Italians, are super sweet and delicious caramelized. When to use: Within a week. Happy veggie share day! Lots of variety this week, but not to fret, there’s also still a good amount of lettuce for you salad-lovers. 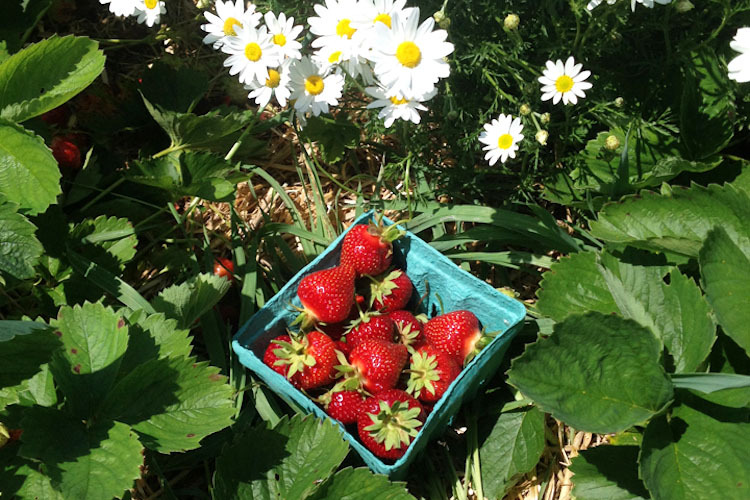 Don’t forget to check out more info, and recipe ideas, from the farm. All the veggies for this week are best stored in an airtight (plastic) bag in the refrigerator, but beets should be stored separately from the greens. The veggie pickup for Thursday, July 5th will be at Sunnyside Community Services from 5-8pm. It’s also pickup for Lewis Waite Farm orders. 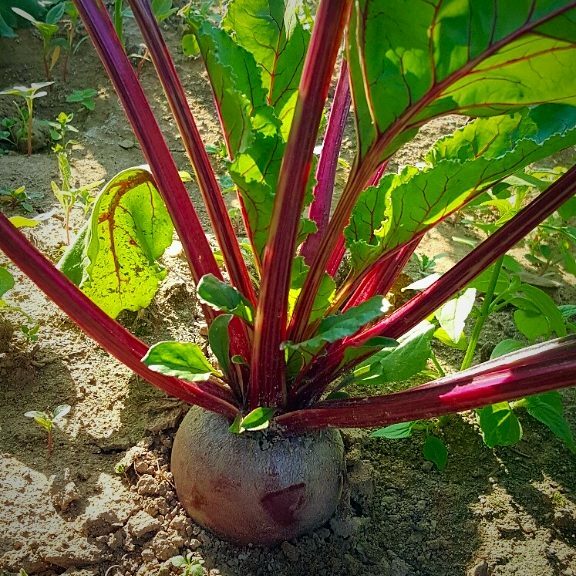 Beets – Separate the green tops from the roots and eat them both! Beets pair well with citrus, walnuts and soft cheeses. The tops can be sautéed with olive oil and a little salt and pepper. Use within 5 days. Mustard Greens Salad Mix – This one’s back by popular demand, and we’re definitely excited to have more. Use within 5 days. Green or Purple Kohlrabi – A very versatile veggie–but don’t forget to peel it first. 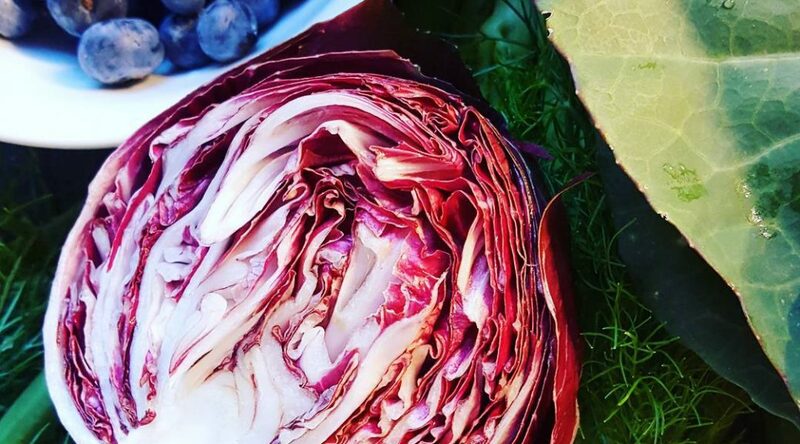 Try it as a slaw, sliced in salads, eaten whole, braised, roasted, grilled… Use within a week. Green Kale – Could this leafy green be any more healthy? Probably not. If you’re not sure how else to eat it, try one of the recipe links. Use within a week.. Basil – Who’s ready for a fresh batch of pesto? Use within 3 days. Zucchini – This week you’ll see yellow and green varieties–they’ll make great zoodles for your pesto. Use within a week. 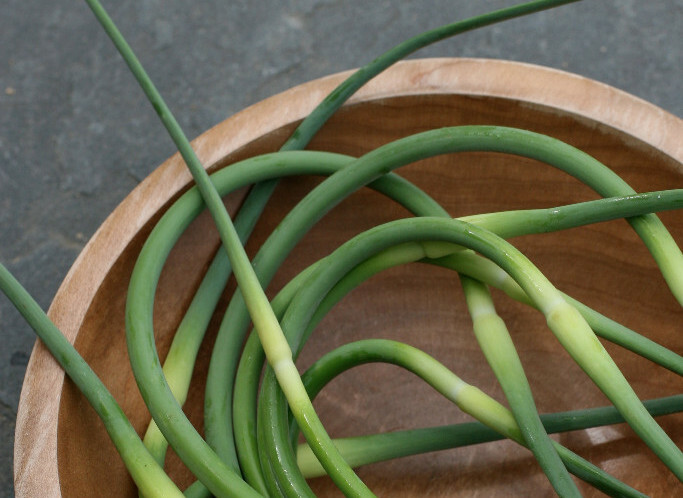 Scallion – Try these grilled and sliced into a salad. Fun fact: you can put the bottoms in a glass of water and they’ll regrow the green tops. Use within a week. Fennel – This is your last week to enjoy fennel–and if you haven’t already tried it, the caramelized fennel recipe from last week is amazing. When to use: Within a week. Greens, greens, glorious greeeeennnss! Check out what’s in the box this week–and if you’re looking for more info or recipes, Golden Earthworm has some tasty looking ideas here. Everything on this week’s list is best stored in an airtight (plastic) bag in the refrigerator. The veggie pickup for Thursday, June 22nd will be at Sunnyside Community Services from 5-8pm. We also have Beer, Soap, Fish, Kombucha… AND Lewis Waite a la carte orders this week! Napa Cabbage – A mild-tasting Chinese cabbage, high in vitamins A & C, potassium and calcium. Great raw–commonly used as kimchi. When to use: Within 5 days. Green Kohlrabi – Another member of the cabbage family, but this one needs to be peeled. When to use: Within a week. Cilantro – You know what to do with this one. 🙂 It also freezes well if you can’t use it all right away. When to use: Within 3 days. 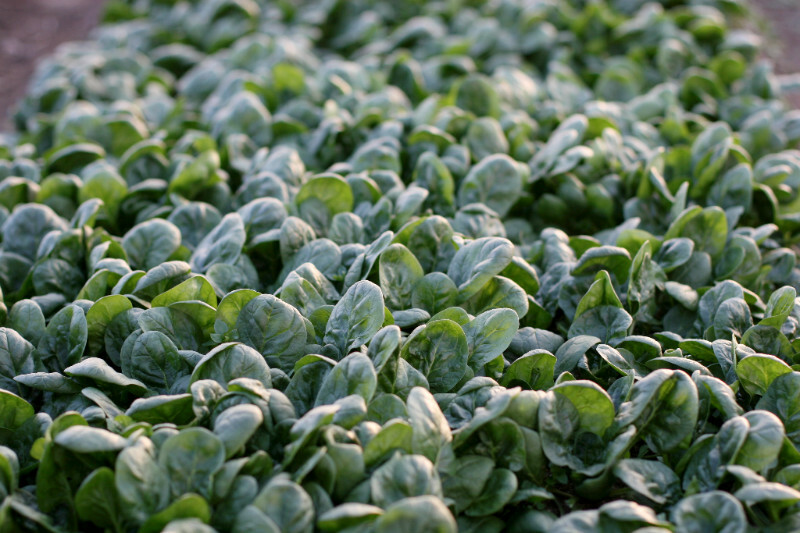 Spinach – This is the next planing, so it’s extremely tender and best eaten raw in a salad. When to use: Within 3 days. 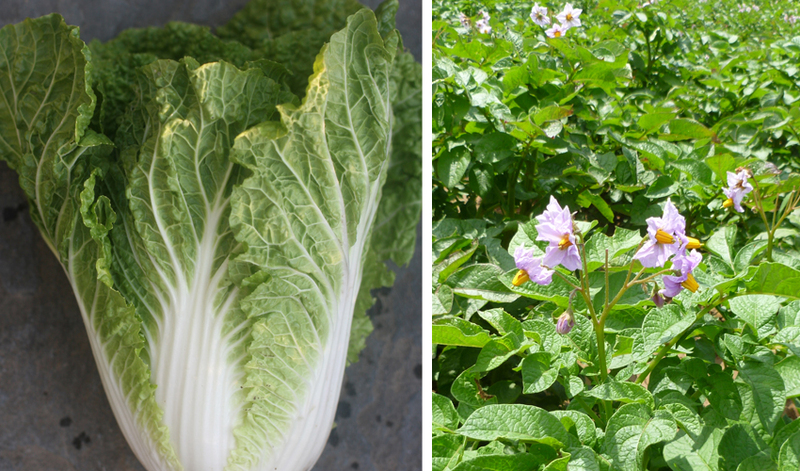 Bok Choi or Japanese Salad Turnips – Depending on the box, you’ll receive one or the other of these. The turnips don’t need to be peeled, and both can be eaten raw or cooked. When to use: Within 5 days. Green Romain Lettuce – This lettuce loves hot weather, and it’s nice and crunchy in a salad. When to use: Within a week. Toscano or Red Kale – Try this one as kale chips, thrown in a cold smoothie or added to a soup. When to use: Within a week. If you find that your greens have gone “limp,” a tell-tale sign of dehydration, try soaking them in a bowl of cold water for a bit to help them perk back up. Who’s ready for more greens?? Check out what’s in the box this week–and if you’re looking for more info or recipes, Golden Earthworm has some tasty looking ideas here. Everything on this week’s list is best stored in an airtight (plastic) bag in the refrigerator. The veggie pickup for Thursday, June 15th will be at Sunnyside Community Services from 5-8pm. Escarole – It looks like lettuce, but it’s not! Escarole a very nutrient-dense vegetable, and can be eaten raw or cooked. When to use: Within 5 days. Garlic Scapes – This is the top of the garlic plant–remove the head and use the rest as you would garlic. It gives a slightly milder flavor. When to use: Within a week. Parsley – Don’t write this off as just a garnish–it’s also great in soups, salads and juices! When to use: Within 3 days. 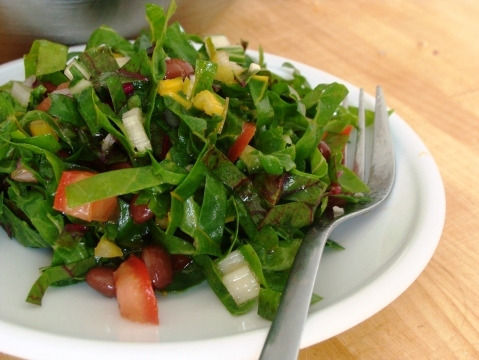 Baby Arugula – This is the next planing, so it’s extremely tender and best eaten raw in a salad. When to use: Within 3 days. Red Romaine Lettuce – Romain loves the hot weather, and holds up great with heavier toppings. When to use: Within a week. Toscano Kale – Try this one as kale chips, thrown in a cold smoothie or added to a soup. When to use: Within a week. Happy second week of veggies! Below is a quick list of what’s in your box this week. If you’d like more info, or a few recipe ideas, check out this week’s email. Baby Spinach – Storage: In an airtight (plastic) bag in the refrigerator. Uses: Raw or cooked. When to use: Within 3 days. Green Kale – Storage: In an airtight (plastic) bag in the refrigerator. Uses: Raw or cooked. When to use: Within 5 days. Red Radishes – Storage: In an airtight (plastic) bag in the refrigerator. Uses: Raw or cooked. When to use: Within 5 days. Green Boston Lettuce – Storage: In an airtight (plastic) bag in the refrigerator. Uses: Raw in a salad. When to use: Within a week. Collards – Storage: In an airtight (plastic) bag in the refrigerator. Uses: Raw or cooked. When to use: Within a week. Please note that any boxes not picked up by 8pm will be donated to SCS and items are subject to change. In general, greens should be stored in an airtight plastic bag or container. They “go bad” when they dehydrate, so never put them straight in your fridge. If you find that they have gone “limp,” a tell-tale sign of dehydration, you can try soaking them in a bowl of cold water for a period of time. Often they will perk right back up again!